The BS Nymph was a car with high hopes initially. With collaboration with Chrysler to supply Hillman Imp mechanical components for the Nymph things looked up. 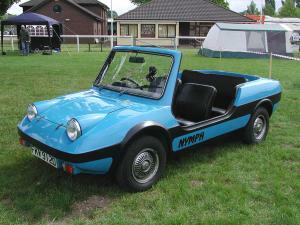 Hailed by Chrysler as a Mini Moke competitor, units of 4,000 sales per annum were hoped. The Nymph was mechanically based on the Hillman Imp and used pretty much all that it could from the donor. Engine out back and suspension bolted to the GRP monocoque. Doors and a hard top were options. Before production could start in ernest Chrysler pulled the plug on the Imp and down the pan went dreams of 4,000 sales per year. Attention turned to kit sales but only 42 were reported to have been sold before the company lost interest and went back to designing cars rather than making them. Kit prices were around £380.